Select the search type from the upper left tag. The default search is title search, where you can perform searches by Direct search or by Title search. Type in 'Image #' box a required through page number of the Meisei Copy (1-908) and click on the GO button. Type a signature of the First Folio, from [pi]A1 to bbb6v, without the prefix 'sig.' in 'Signature' box and click on the GO button. NOTE: The recto pages can be designated with or without an r. Both, e.g. A1r and A1 are valid. Please type [pi] for π meaning preliminaries, [para] for ¶, and [chi] for χ. The First Folio has quite a number of misprinted, duplicated or other anomalous signatures. These pages can be searched according to the following table, which also includes all the signatures of the preliminaries. Please note that the signature designations adopted here are based on both W.W. Greg's system in A Bibliography of the English Printed Drama to the Restoration, vol. 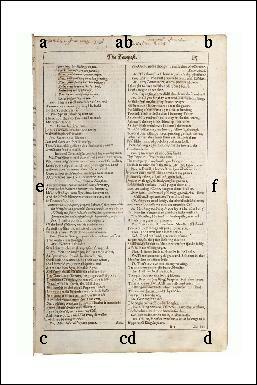 III (1970) and Dr. Yamada's system in The First Folio of Shakespeare: A Transcript of Contemporary Marginalia(1998). Here you can search Folio pages with words that appear in the marginal annotations as transcribed in The First Folio of Shakespeare: A Transcript of Contemporary Marginalia, Tokyo: Yushodo, 1998, [ISBN4-8419-0252-X] (© Akihiro Yamada 1998). The words that can be used in searches are given in the original word-forms as they occurred in the marginal notes and not in the modern forms. Words that are included in the index in The First Folio of Shakespeare: A Transcript of Contemporary Marginalia, pp. 295-316 can be used in searches. Select the initial letter of the word required from the alphabets at the top. NOTE: J, U, X, Z do not function since no words in the index begin with these letters. Or type the entire word or a part of the word from the beginning in 'word used in the marginalia' box and click on the search button. NOTE: You can type the letter(s) either in upper case or in lower case. (*) indicates the old forms which are not found in the Oxford English Dictionary (Second edition, prepared by J. A. Simpson and E.S.C.Weiner. Oxford: Clarendon Press, 1989). (+) indicates the words which the Oxford English Dictionary describes specifically as Scottish in respect to form or meaning. The recto pages are designated by signatures without 'r's. The positions of the 8 codes in the above figure correspond to the positions of the icons, attached around the folio page images in the search page, for opening the close-up-image windows and the windows showing the texts of the Yamada transcripts. The occurrences coded 'ab' or 'cd' occur in the long marginal notes which stretch from division a to division b or from division c to division d.
Here you can search by words that appear in the marginalia corpus of the Yamada transcript. NOTE: X does not function since no words in the marginalia begin with the letter. Please note: the differences of type cases and inflectional forms are all identified individually in this search. The rest of the search procedures are identical with those in 1.3.1. To select the image sizes, click on one of the four buttons; S (for small), M (for medium), L (for large) or XL (for extra large). The default size is S.
The signatures are indicated in the upper left corner. The notes by Dr. Yamada are shown at the bottom of the window: the numerals before the notes correspond to the foot note numbers in the text within the window, while (**) indicates the overall features of the texts within the window.